For the football fan who cooks, tailgates are a beautiful thing. Unlike other parties where the host feels a lot of pressure to impress, this pre-game festivity can be as fancy or down-home casual as the cook likes or has time for on any given Saturday or Sunday during football season. So long as the conversation and cold bee are flowing, and there’s plenty of great-tasting food to nosh on while you critique the competition, the gathering can’t help but to be a hit. That said, you still have to come up with a menu that travels well and doesn’t require a ton of work once you hit the stadium parking lot. Not to mention lends itself to eating while standing up in crowded quarters. Smothered under a variety of toppings and condiments or nearly naked on the bun, with just a squirt of Heinz ketchup separating meat from bread, burgers are a traditional gameday favorite for Black ‘n’ Gold tailgaters. In fact, it’s hard to imagine a kick-off at Heinz Field that isn’t preceded by the wonderful smell of meat patties sizzling on the grill in the parking lot. This season, we’d like to help you build an even better burger, with some fresh takes on the standard components. All of them can easily be made ahead with just a few simple ingredients. 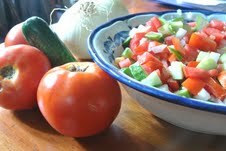 A few can do double duty, serving as side dishes for bigger appetites or as a tasty dip for chips and/or sliced veggies. If only making it to the Super Bowl were so easy! At the heart of every great burger is the patty, so pay attention when it comes to buying the meat. With ground beef, an 80/20 blend of lean to fat is best, says Jim Calato of City Gourmet Catering, which operates the City Deli in the basement of the Koppers Building at Seventh and Grant streets, Downtown; any more fat, and you not only stand a good chance of flare-up during grilling, but also the burger will shrink well beyond the size of the bun. Tempting as it might be to make and freeze the burgers in advance, the best burgers, says Mr. Calato, are those made fresh right before cooking. “Ice crystals compromise the quality of the meat,” he says. Even more important is a light touch. Overworking the meat when shaping it into patties is a recipe for dense, dry disaster. For even cooking, make the center of the patty thinner than the edges, as burgers plump when you cook ’em. A little salt sprinkled on the outside will make for an extra-crispy crust. One way to immediately up your burger game is to experiment with different meats. Below, we offer two patties that go beyond the traditional beef blend. To make them even more tailgate friendly (i.e., easy to balance in one hand) consider shaping them into 3-ounce sliders and serving them on dinner-sized rolls or brioche. Don’t worry if you can’t find chorizo in bulk — I simply cut the casings off chorizo links. Add the wine a little at a time to prevent it from getting too soupy. Mix ingredients together in large bowl. Form meat into 8 individual patties. Place burgers on a hot grill, and cook until desired doneness, about 10 to 12 minutes. Serve burgers topped with provolone cheese, fried onions, lettuce and chipotle mayonnaise (2 cups mayonnaise blended with 1 tablespoon chopped chipotle peppers in adobo sauce). 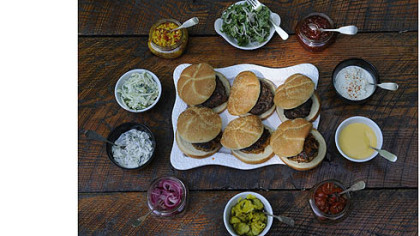 These lean turkey burgers from Rachael Ray’s new “The Book of Burger” will appeal to the non-beef eaters in the crowd. Rachael likes to fry them on a flat-top griddle or cast-iron pan (it creates a crispier crust), but you also can cook them on a grill. A little blue cheese sauce on the top (recipe below) and you’re good to go. In a large bowl, combine first 6 ingredients. Mix thoroughly. Score into 4 equal portions and form them into patties slightly thinner at the center than at the edges for even cooking and to ensure a flat surface (burgers plump as they cook). Drizzle the patties with oil. Heat a large nonstick skillet over medium-high heat. Cook burgers, flipping once, 10 to 12 minutes, or until the juices run clear. Remove to a plate. Wipe pan clean and reduce heat to low. Melt butter in pan and stir in hot sauce. Return the burgers to the skillet and turn to coat in the hot sauce-butter mixture. Don’t worry about skinning or seeding the tomatoes in this simple jam recipe — they give the final product texture. A savory substitution for ketchup, the jam also tastes delicious slathered inside a grilled cheese sandwich or dolloped on top of meatloaf. Combine all ingredients in a heavy medium saucepan. Bring to a boil over medium heat, stirring often. Reduce heat and simmer, stirring occasionally, until mixture has consistency of thick jam, about 1 hour 15 minutes. Taste and adjust seasoning, then cool and refrigerate until ready to use; this will keep at least a week. Barbecue isn’t the only thing that benefits from slow and low cooking. This super-simple preparation brings out the tomatoes natural sweetness. The balsamic syrup is addictive. Preheat oven to 225 degrees. Line 2 baking sheets with parchment paper and place tomatoes, cut-side up, on the pan. Sprinkle shallots and garlic around the tomatoes. Drizzle them with oil and sprinkle with a pinch of salt. Roast until tomatoes are shrunken and sweet, about 2 hours, switching the pan positions after an hour. Transfer them and any juices on the pan to a medium bowl. In a small saucepan, combine vinegar, agave syrup and rosemary and bring to a boil. Cook for about 5 minutes over medium heat, until liquids reduce to 1/4 cup and form a thick syrup. Remove rosemary with a fork and season the syrup with a pinch of salt. 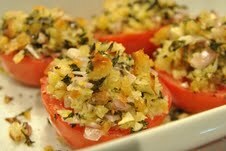 Toss tomatoes with bread crumbs to soak up the juices, if desired. Drizzle the syrup over the tomatoes and serve. Makes about 1 cup of roasted tomatoes. 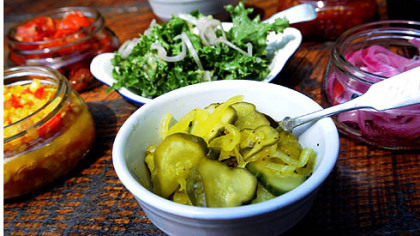 These are for sweet pickle lovers. In a medium bowl, combine the cucumbers, onion and salt. Mix well. Cover the mixture with ice. Let stand at room temperature for two hours. In a pot, bring sugar, vinegar and spices to a boil. Rinse cucumbers and onions with water and drain well. Add to vinegar mixture and bring almost back to a boil. Remove from heat and cool. You can store the pickles in an airtight container for up to three weeks in the fridge. They will begin tasting pickled in just a couple hours. 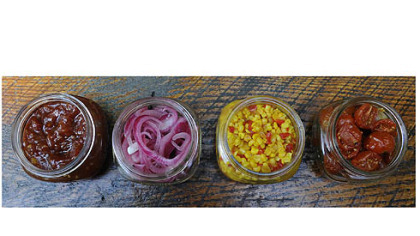 You don’t have to be vegan, or even vegetarian, to love this tangy corn relish. Spoon the leftovers onto grilled hot dogs, or use it to add kick to Mexican or Tex-Mex cuisine. You also could stir it into corn bread. In a medium-sized saucepan, combine vinegar, sugar, mustard and turmeric. Bring to a slow boil over medium heat. 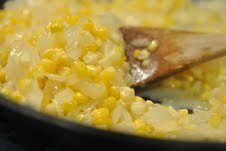 Add corn, onion and bell pepper and simmer for 5 minutes. Serve hot, cold or at room temperature. This slaw pairs well with a turkey or chicken burger. Core apples and cut into matchsticks. Coat with lime juice. Toss in a bowl with cabbage, scallions, lime zest and cilantro. Make dressing by combining mayonnaise, sour cream, remaining lime juice and sugar. Add salt and pepper to taste. Coat slaw with dressing. Don’t let the slightly bitter taste of frisee (curly leaf endive) put you off — when paired with salty bacon, it is nothing short of divine. Whisk together mustard, olive oil, shallot and bacon drippings. Season to taste with salt and pepper. Add frisee. Makes enough for 4 to 6 burgers. This easy mayo will keep in the fridge for up to 3 days, and has a nice, slightly charred flavor. Also tasty on fish sandwiches. Prepare a medium-hot grill. Place a perforated grill rack over the grill grate. Brush the onions with olive oil and season with salt and pepper. Place scallions on the perforated grill rack and grill, turning every minute or so, until the onions get good grill marks. Let cool. Chop the onions and combine with mayonnaise, lemon zest, lemon juice and basil until well blended. Serve right away or cover and refrigerate for up to 3 days. This tart burger topping take just 5 minutes to prepare, but the flavor is boundless. Stir the onions into potato salad, layer them in quesadillas, sprinkle them on salad greens or use them as a garnish for hors d’oeuvres. Heat all ingredients except onions with 1 cup water to a simmer in a saucepan. Simmer for 5 minutes and remove from heat. Pour the pickling liquid over the onions in a mixing bowl and let cool to room temperature. Reserve the onions in the liquid until you are ready to use them. Onions will hold refrigerated for 7 to 10 days. Makes 3/4 cup, or enough for 6 burgers. Any beer will do in this recipe (I borrowed a Michelob Ultra from my neighbor), though the better the brew, the better the sauce. I used the leftovers for mac and cheese; it also would be good as a chip dip or drizzled on nachos. Melt butter in a saucepan over medium heat. Stir in flour and mustard powder; cook, stirring, 2 to 3 minutes (do not brown). Whisk in beer; bring to a simmer, then whisk in half-and-half. Simmer, whisking, until thickened, about 4 minutes. Stir in grated cheddar and horseradish. A perfect topping for your Buffalo burger, or as a dip for crudites. Mash blue cheese with the back of a fork in a small dish. Stir in remaining ingredients. Slather on top of burger buns. Makes enough for 4 burgers. They look invincible. Yet beneath those steely, confident exteriors, the Pittsburgh Steelers struggle just like the rest of us schlubs — at least when it comes to their diets. The underweight players are attempting to pack on a few extra pounds. The heavier ones are working on losing some. And those who fit into their black and gold uniforms just right are doing their best to maintain. Not an easy proposition when everyone’s eating three meals a day of the same food, practice leaves you starving and everything on the all-you-can-eat buffet tables looks soooo delicious. Actually, it got a whole lot easier for players this year at the Steelers’ 47th annual summer training camp at Saint Vincent College in Latrobe, which wraps up its three-week run tomorrow with an open practice from 3 to 5 p.m.
Those who cook for the team before the season commences initiated a new program that makes meal portioning as easy as filling Heinz Field with fans on a Sunday afternoon. 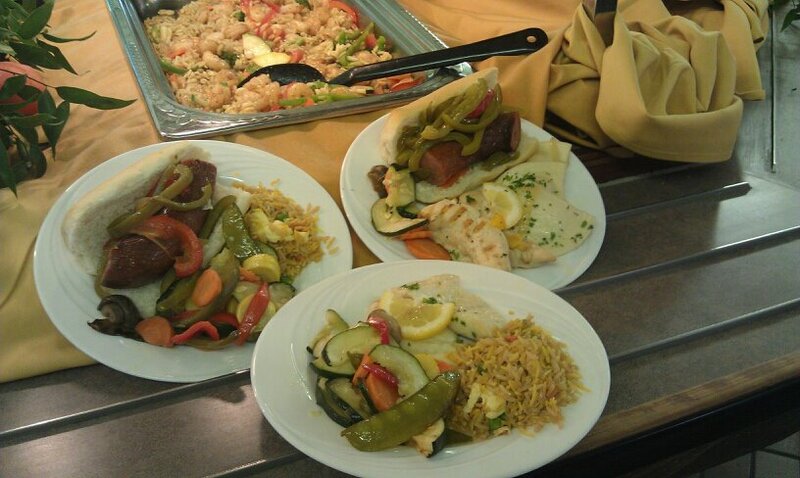 Rather than guess how a plate of kielbasa and sauteed veggies stacks up nutritionally to one that holds homemade pierogies or a piece of grilled fish — or in the case of those with the biggest appetites or caloric requirements, all of the above — a sign at the head of the buffet line spells it out for them in black and white: number of calories per serving, plus total grams of fat, protein and carbohydrates. But what really drives the point home is a side-by-side comparison of actual plates. It’s one thing to mentally measure up that perfect portion, but it’s another thing entirely to see it right there in front of you, down to the exact tablespoon of steamed rice or ounce of grilled turkey. Do you want to gain, maintain or wane? Simply choose the serving suggestions that correspond. Also new this year is an emphasis on performance drinks. They’re made with fresh fruits such as pomegranate or kiwi and given a boost with flax seed. Because they’re so much bigger than your average Joe, NFL players often are thought of as meat-and-potatoes kind of guys. What they really like is their vegetables — along with whole grains such as quinoa and wheat berries. That’s because like most professional athletes, they have become much more conscious in recent years of the connection between healthy eating and performance. In order to maintain the high energy levels for pre-season training and games, they fuel their bodies with all the healthful, nutrient-rich food they can get. There’s still a fair amount of pasta on the daily menu, said Chef Laskie, who has been cooking for the team for 10 years. There also are higher-fat dishes such as ribs and hot wings (a favorite late-night snack). But not as much as you might think. Today, fish — loaded with omega 3 fatty acids, which helps bodies recover after strenuous exercise — is a big crowd pleaser, along with lean grilled meats, fresh fruits and a wide array of vegetables, cooked and otherwise. Most meals include a trip to the massive salad bar in the middle of the dining room, where at least three greens vie for attention along with eight vegetables and array of homemade dressings and bacon bits. One of the most popular menu items, says Chef Laskie, who graduated from Westmoreland County Community College’s culinary program, is the turkey burger. Served with a zesty Asian-style slaw, it’s made from a mixture of ground, brined turkey breast and chicken thigh, and cooked on a charcoal grill right outside the dining room. It’s not unusual for the team and their guests to go through more than 1,000 a week. “I can’t eat a lot of stuff in the summer, but I eat the turkey burgers every day,” said veteran backup quarterback Byron Leftwich. Another team favorite is the wood-fired pizza oven at the opposite end of the dining room. Most days it cooks up a choice of at least four pizzas and cheesy bread, all crafted from dough made fresh each day in the kitchen. There’s also a deli station with made-to-order sandwiches and paninis, a grill station featuring everything from bison to chicken, and a “Park Side” station with hot food items such as mashed potatoes and spicy ethnic dishes. Soup comes from house-made stocks. In addition, four bakers crank out a tempting display of desserts, though players as a rule aren’t too big on sweets. On a recent Tuesday, selections included a flaky fruit tart brimming with fresh berries, pumpkin cake, oatmeal raisin cookies and for the players’ kids, Ho Hos Cupcakes. To help replace nutrients sweated out during practice, the kitchen employees, which this year included 50 seasonal workers in addition to the regular staff of 75, also served up glass after glass of orange, apple and other juices — some 530 gallons over the course of the four-week camp, or nearly 8,500 8-ounce servings. Breakfast at training camp entails nearly as many choices. In addition to an omelet station where players can choose from more than a dozen kinds of fillings, there’s homemade oatmeal, cereals and a variety of baked goods. Smoothies made by whirling together fresh fruits and yogurt get a nutritional push with protein powder. Because the menu needs to be approved in advance by team nutritionist Leslie Bonci and other staff, Chef Laskie and Mr. Esmi start planning early in May. By July 15, everything is confirmed, though not set completely in stone: Menu offerings are continually tweaked based on players’ likes and specials requests. To keep things exciting for players (and themselves), the culinary staff also cooks up a “surprise” every two or three days. Last week, for example, the team enjoyed a Brazilian barbecue of rubbed beef sirloin and brined turkey breast kebabs. Another night it was sushi. “This is the players home for four weeks, and we want to do our part to make sure they’re happy,” said Chef Laskie. 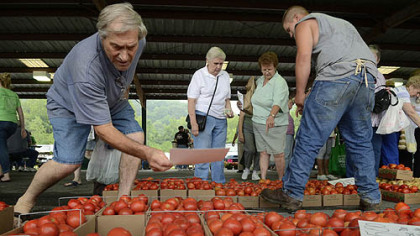 Besides, he added, hospitality is part of the St. Vincent tradition. Which is why the culinary team also is responsible for preparing the concessions that feed the 5,000 to 10,000 fans who visit camp on any given day: hot dogs, pretzels, nachos. Given all their workouts, it’s not unheard of for an NFL player to consume 5,000 calories or more each day during training camp. Multiply that by 90, plus what the 15 coaches, other staff and invited guests end up eating, and the end result is a grocery list that rivals that of a big restaurant. This year’s food order included 1,600 pounds each of chicken and beef, along with 1,100 pounds of fish. By the time camp concludes tomorrow, players also will have eaten their way through 1,200 pounds of cheese, 1,500 pounds of fresh seasonal veggies — a majority of it sourced locally — and two tons of fresh fruit. That’s 120 pounds of bananas, peaches, oranges and apples each day. Parkhurst continues the program at the UPMC Sports Performance Complex on the South Side once the season gets underway. Feeding the Steelers during the annual pilgrimage to St. Vincent’s requires a herculean effort, with the morning crew arriving at 4 a.m. and the night crew working well past midnight. But no one’s complaining. Not even when there’s barely a second to catch your breath, let alone take a coffee break. Hamburgers are so passe, at least when they’re made with beef. These tasty, low-fat poultry burgers are one of the Steelers’ favorite lunch foods at training camp, says Executive Chef Rick Laskie. Made with turkey breast that’s brined, roasted and ground on site (for his brine recipe, see below), they’re charcoal-grilled right outside the dining room. Chef Laskie wasn’t too eager to share his “secret recipe,” so whether or not the burgers are an exact replica of what the team chows down on after practice is anyone’s guess. But they’re close enough — and absolutely terrific. Add the soy sauce a little at a time — depending on how finely ground the meat is, the mixture can quickly get soupy and thus difficult to grill. In a large mixing bowl, combine ground meat with green onions, cilantro, soy sauce and ginger. Shape mixture into 5-ounce patties. Charcoal-grill burgers to 165 degrees to cook through. 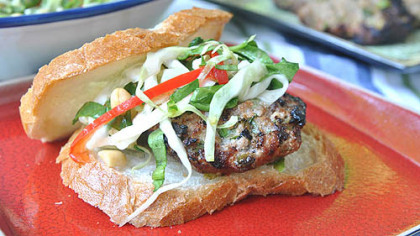 Serve burgers on wheat kaiser rolls with Asian Slaw. For dressing, whisk together oil, garlic, soy sauce and lime juice. In a separate bowl, combine spinach, cabbage, onions, pepper, peanuts and basil or mint. Drizzle slaw with dressing, and toss well. Serve with Thai Turkey Burgers. Mix ingredients in a large, clean bucket or bowl. Place turkey breast-side down in another bucket, and pour brine over. Cover with plastic wrap. Brine turkey 20 to 24 hours. Rinse well before roasting. Wheat berries (whole, unprocessed wheat kernels) look sort of like brown rice and are just as easy to cook. Chewy and nutty, they’re incredibly nutritious and are hearty enough to stand up to even the boldest dressing. I used spelt berries from Clarion River Organics (www.clarionriverorganics.com, $2.50 per pound) but you can find wheat berries in most specialty grocery stores. Rinse berries with cold water, submerging to remove soil particles; drain. Simmer wheat berries in lightly salted water for 25 to 30 minute, or until they are chewy but not crunchy. Drain and rinse berries under cold water. 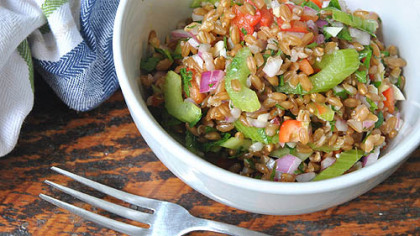 Toss wheat berries with celery, peppers, onion, garlic and parsley. In a separate bowl, combine oil and vinegar and whisk to combine. Drizzle dressing over salad and toss to combine. (I only used about half.) Salt and pepper to taste. Refrigerate and serve cold with fresh sliced tomatoes. 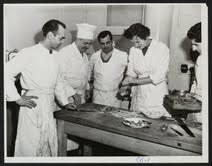 Julia’s 7 a.m. cooking class with GIs at Le Cordon Bleu, Paris, 1950. Schlesinger Library, Radcliffe Institute. Born on Aug. 15 to a wealthy family in Pasadena, Calif., Julia died two days shy of her 92nd birthday in 2004, leaving behind a tasty legacy of more than a dozen cookbooks and hundreds of episodes from her 13 television series. In the process, she changed the way Americans thought about cooking and eating — and not just the fancy-pants French cuisine she mastered while living in Paris with her husband, Paul Child, whom she met during World War II while working in Ceylon for the government. What most of us remember first about Julia is “The Voice,” which warbled and trilled like some kind of strange bird. But we also adored her sense of humor, and unbridled enthusiasm for cooking and eating, calories and fat content be damned. (“If you’re afraid of butter,” she famously quipped, “use cream!) Most of all we loved her wacky self-confidence. Julia not only inspired a heck of a lot of home chefs to stretch themselves in the kitchen, but also an entire generation of “real” chefs, including Jacques Pepin and Wolfgang Puck. When she arrived on the scene in the early 1960s, cooking from scratch for many Americans had become almost passe, with housewives instead seeking out convenience foods: frozen fish sticks, packaged cake mixes, canned vegetables, TV dinners. She made it hip again, or at least something worth trying, in part because she made cooking fun. “She took this very intimidating idea of cooking, and translated it into something people could actually do,” says PBS chef and cookbook author Christy Rost, who grew up in Pittsburgh and is heading back here later this month to do cooking demos in honor of Julia’s centennial at local Market Districts stores (see box). A large part of that involved showing people that not only was it OK to make mistakes when cooking, but also necessary: Only through failure do you finally learn. “And there is something very endearing and freeing about that,” says Ms. Rost. “She was a mentor to everyone who was getting started, no matter what you were doing,” says Ms. Rost, who met her several times over the years and will be bringing a collection of Julia artifacts to her demos in Pittsburgh. The treasured pieces, which she purchased at an auction before Julia’s death to benefit the American Institute of Wine and Food, include the white kitchen scale “with the big beautiful round face” pictured on the cover of 1978’s “Julia Child & Company,” and a large metal spatula Julia used for making pastry. 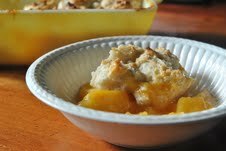 The online headquarters for all things Julia can be found at facebook.com/JuliaChild. You also can follow along on Twitter at @JC100; on Pinterest at pinterest.com/knopfbooks/jc100; and on Tumblr at jc100.tumblr.com. Not all Julia fans cook, but they all must eat. One of the marque events being touted by JC100, then, is Julia Child Restaurant Week. One hundred restaurants in more than 30 cities will rework their menus to include some of the cook’s signature dishes from Aug. 7 up to her birthday on the 15th. Alas, only one Pennsylvania eatery is participating, and it’s all the way across the state in Philadelphia, at Center City’s famed Le Bec Fin. Yet it may be well worth the six-hour drive on the turnpike: In addition to such classics as French onion soup and ratatouille, chef Walter Abrams will be whipping up lobster Americaine and crepes suzette. Info: www.lebecfin.com or 1-215-567-1000. • Les Dames d’Escoffier (LDEI), a women’s professional culinary association to which Julia belonged, is honoring the special day with “Julia” celebrations in 25 of its chapter cities around the country this month and next. The closest to Pittsburgh is in Cleveland on Aug. 15, where members — who will dress up as Julia, right down to her pearls — will host a light summer supper featuring her recipes. • The Julia Child Kitchen at the National Museum of American History in Washington, D.C., has been closed to the public since January to allow for renovations to the museum’s west wing. To celebrate her centennial, it will be back on display for a limited time, Aug. 15 through Sept. 3, in the east wing. Designed by her husband, Paul, for their home in Cambridge, Mass., it was the setting for three of her TV shows and the testing ground for many of her recipes. It features 1,200 tools, appliances and furnishings, all arranged exactly as they were when she donated the kitchen to the museum at age 89 in 2001. Entrance is free. 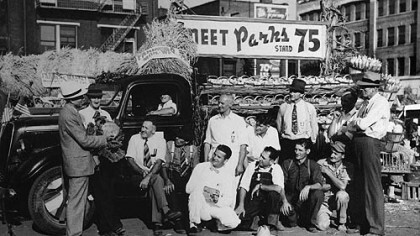 Julia-inspired events in the museum’s Warner Bros. Theater (Flag Hall) include book signings by Alex Prud’homme of “My Life in France,” which the New York-based writer co-wrote with Julia during the last eight months of her life; Jessie Harland, who wrote the children’s picture book “Bon Appetite! The Delicious Life of Julia Child”; and Bob Spitz, whose new biography, “Dearie: The Remarkable Life of Julia Child” (Knopf, 2012, $29.95), will arrive on store shelves Aug. 15. It weighs in at 557 pages and includes 30 photographs. • Want to learn how to make cheese souffle or asparagus with hollandaise? Sur La Table will offer cooking classes in many cities on Aug. 15 ($69, with a limited number of spots) during which instructors will walk participants through several of her most famous dishes. Don’t worry if the first couple of batches don’t turn out exactly right — mayonnaise eluded Julia for the longest time, too, according to author Bob Spitz in his upcoming biography, “Dearie,” which arrives on shelves Aug. 15. (The key is to add the oil SLOWLY.) Once you get the hang of it, though, you’ll never buy commercial mayo again. Lately, we’ve been slathering it on tomato sandwiches. Warm a round-bottomed, 2 1/2- to 3-quart glazed pottery, glass or stainless steel mixing bowl in hot water. Dry it. Add egg yolks and beat for 1 to 2 minutes until they are thick and sticky. Add vinegar or lemon juice, salt and mustard. Beat for 30 seconds more. The egg yolks are now ready to receive the oil, and while it goes in, drop by drop, you must not stop beating until the sauce has thickened. A speed of 2 strokes per second is fast enough. You can switch hands or switch directions, it makes no difference so long as you beat constantly. (I cheated and used a KitchenAid mixer.) Add the drops of oil with a teaspoon, or rest the lip of the bottle on the edge of the bowl. Keep youR eye on the oil rather than on the sauce. Stop pouring and continue beating every 10 seconds or so, to be sure the egg yolks are absorbing the oil. After 1/3 to 1/2 cup of oil has been incorporated, the sauce will thicken into a very heavy cream and the crisis is over. The beating arm may rest a moment. Then beat in the remaining oil by 1 to 2 tablespoon dollops, blending it thoroughly after each addition. When the sauce becomes too thick and stiff, beat in drops of vinegar or lemon juice to thin out. Then continue with oil. Season to taste using vinegar, lemon juice, salt, pepper and mustard. If sauce is not used immediately, scrape it into a small bowl and cover it closely so a skin will not form on the surface. This is turning out to be a banner year for tomatoes, the star attraction of this savory baked side dish. It couldn’t be less fussy, but the simple preparation allows the flavor of the fruit to really shine. Serve with grilled meat or fish, or alongside a quiche or omelet. Remove stems from tomatoes, and cut in half crosswise. Gently press out the juice and seeds. Sprinkle the halves lightly with salt and pepper. Shortly before you are ready to serve, place tomato halves in the upper third of the preheated oven and bake for 10 to 15 minutes, or until the tomatoes are tender but still hold their shape, and the bread crumb filling has browned lightly. I first had this classic salad as a newlywed — my mother-in-law was a huge Julia fan, and this was her favorite way to serve potatoes. It has a wonderful tanginess you don’t find in mayonnaise-based potato salads. Scrub potatoes. Drop them in boiling salted water to cover, and boil until potatoes are just tender when pierced with a small knife. Drain. As soon as they are cool enough to handle, peel and cut them into slices about 1/8 inch thick. Place them in a mixing bowl. Pour wine or vermouth and stock or bouillon over the warm potato slices and toss very gently. Set aside for a few minutes until the potatoes have absorbed the liquids. Beat vinegar or vinegar and lemon juice, mustard and salt in a small bowl until the salt has dissolved. Then beat in the oil by droplets. Season to taste, and stir in the optional shallots or onions. Pour the dressing over the potatoes and toss gently to blend. Serve them while still warm, or chill. Decorate with herbs before serving. This recipe is simple but looks so impressive on the plate that you’ll feel as if you had put one over on your dinner guests. Local potatoes are plentiful now at area farmers markets — I got some beauties at the Janoski’s stand at the Original Farmers Market in South Fayette — but you’re probably going to have to search harder for mini chorizos, a Spanish pork sausage sized for grilling and flavored with smoked paprika and garlic. Unable to find them, I ended up cutting large chorizo links from Parma Sausage in the Strip into bite-sized pieces, which worked just fine. Be careful not to overcook the potatoes, or they’ll turn into wallpaper paste. (Trust me!) Not that they still won’t taste delicious. In a large pot of boiling water, boil potatoes until soft. In a skillet, heat olive oil and garlic together on medium heat for 7 minutes, until garlic is cooked through, soft and brown. Drain potatoes and put them in a food processor with garlic, olive oil, butter, cream, sage and salt. Puree well and set aside; keep hot. Heat a grill to medium-high. 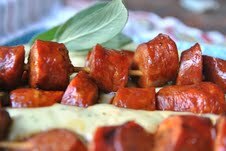 Thread cantimpalitos onto skewers, 6 pieces per serving. (If using wooden skewers, remember to soak them in water for at least 1/2 hour beforehand.) Grill for 4 minutes per side. Divide potatoes onto 6 plates and top each serving with a skewer of grilled sausages.